My apologies for not posting for a week. I have been battling a serious illness for over a year now. I was completely better and now I have regressed again. So, I am trying to post 2/3 times a week. Keep checking back but please understand If I have not posted, it is due to work and doctors and health stuff. I plan to post a few recipes next and then another installment in the college application process. I read a ton. It is one of my favorite things in the world to do. I am in 3 book clubs and I read all kinds of books. I also like almost everything I read so I hesitate to write critiques but I'll try here. As the titles imply, these are about a Southern family of three sisters and their Mom and Grandmom. They live in a coastal town in Georgia and the story revolves around their relationships and trials and tribulations. These are the first two books in a series of three. I loved them. They are light, easy reading and I felt like I knew each of the characters. I want to be friends with this family in real life. The characters are likable yet flawed and the story keeps you hooked. I seriously cannot wait for the third book. If you need something easy to entertain you, these books are great. 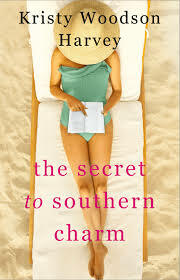 I highly recommend them especially if you like beachy, Southern Chick-lit (which I love!). Now, if you like suspense and mystery, I read this one a few weeks ago. It was Reese Witherspoon's book club pick a month or two ago. 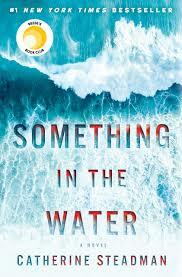 If you liked Gone Girl and those other twisty, turny dark mysteries, this is good. Sometimes I like them and sometimes they make me too jittery. I liked this one. I like to completely mix up the types of books I read so this is completely opposite of the light ones above. The plot kept me interested and even Dave (who doesn't read much) read it on a long flight and enjoyed it. I also really enjoyed this book this month. 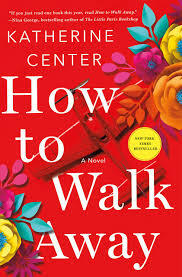 As you know, I am afraid of flying and I was not sure I could handle this book because there is some of that in there. But I ultimately really liked it. It deals with injury, love, recovery, family secrets, strength and redemption. I read this book in about 2 days. I enjoyed it a lot. These next two books are so good. 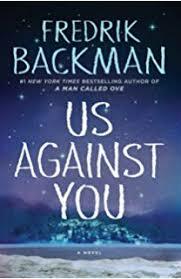 I read Beartown at least a year ago for one of my bookclubs and I am currently reading the sequel, Us against You (also for bookclub). The author, Fredrik Backman (A Man called Ove) is such a gifted writer. He takes a long time to set the scene and introduce the reader to the large cast of characters in this novel but once he does, you cannot put it down. You feel like you are living in the town and part of the community. 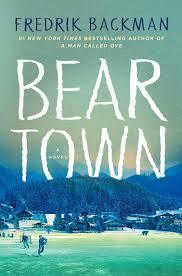 Beartown deals with a sexual assault in a small hockey town and is very timely given our current political climate. I read it before the Brett Kavanugh hearings but one of my other bookclubs read it that week and we had quite the lively discussion. I honestly had no desire to read this book given the description but it draws you in. I think this author is so gifted at writing three dimensional characters that the reader grows to love. 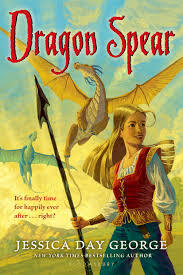 Another book that dealt with teen issues and community was All we ever wanted. 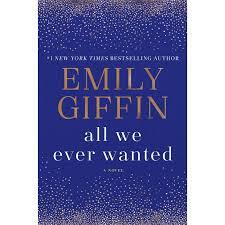 I like Emily Giffin for her light chick lit books about marriage and motherhood. However, this one was different in that the subject matter was much more serious. It takes place in a wealthy suburb of Nashville. A mother is faced with the possibility that her son (who is headed off to an Ivy league college) has done something horrible. 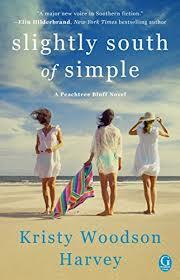 While the subject matter was heavier than her usual books, I really liked this book. It is timely as it deals with sexual misconduct and social media. It deals with all of the pressures that today's teens face. Having a senior in high school, I could empathize with many of the characters. I have also ordered several books for Kate from Amazon recently. I typically read on my iPad but I get her the physical books and that is what she prefers. I took a chance on this series and she has loved it! Kate is kind of sick of reading your typical "middle school" books. 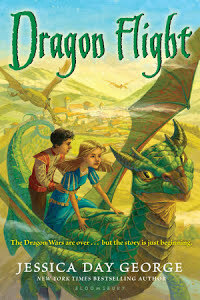 She has flown through this 3 book series though. 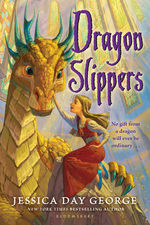 It is probably on the easy side for her as it is recommended for 10 and up and grades 5-6. She is 12 and in 6th grade but she loves them. I love that they have a brave young female as the lead character. I could go on and on but I am out of time and energy. Let me know if you like these posts and any of your favorite books in the comments please. Have a great weekend!!! Disclosure: Some of the links on my website are affiliate links. Many links on this blog are not. I like to share with you where I get the things I love. I have done this long before affiliate links existed. This means that if you purchase an item from an affiliate link here, I may receive a small commission. I only link to products/companies that I like and use. I have never been compensated in exchange for a blog post. Being a homebody, I kind of hate shopping out in stores but I love shopping online much to my husband's dismay. I have found some incredible things on Amazon lately and just have time to share a few with you today but will likely make this a regular feature here. First, I am so glad that scarves are back in style. 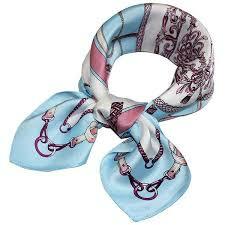 I love them and saved many of my silk scarves from 20 years ago. But I also found a few new ones that I have been wearing non stop. 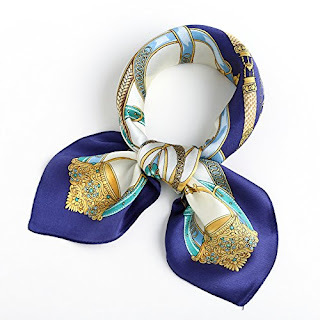 This one is a beautiful silk square and I have worn it several times already. It was a steal at under $15. That is a terrible screenshot of me wearing it last week. This photo also shows the glasses I talk about below. I should have taken real photos but haven't had time. I have also worn this orange one a few times. I love it. It is not silk but looks and feels exactly like it. I also have it in the most beautiful pale turquoise (series 3 blue) as well as the orange one. 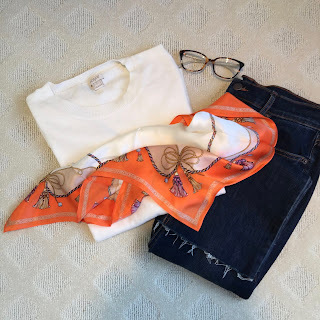 I just feel like a pretty scarf can take a very simple outfit and make it much more chic. These scarves are under $10 and really add a lot to my existing wardrobe. Oh and I got these earrings a few weeks ago and love them. I posted a photo in my Instagram stories and several people wanted to know more about them. They are lightweight and very stylish. They come in a light color and a darker more traditional tortoise. People have also asked me about my glasses a lot lately. I ordered them both on Amazon too and took them to Costco to have my prescription lenses put in. I have a small face and kind of know the measurements I can get in eyeglasses. I also knew that Amazon is great about returns, if I did not like these frames. 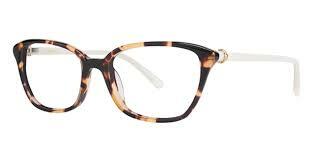 These are the glasses that I get the most questions/comments about. I love them. I have a very, very small face so they are probably slightly large for me (see screenshot above). But I think they would fit most faces. They seem universally flattering. I have had mine about a year. These are my other glasses that I wear everyday. I plan to do a whole skin care post soon but these masks could not wait. I have not always been the best at skin care. But in the last few years, I have really started taking better care of my skin. 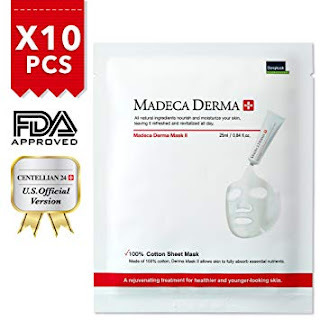 I do not think most masks in general are worth the time and money but these really make a difference in my skin. I use this mask about once every week or two. The price is great and it come with 10 masks. Okay, the last thing is a supplement. I am NOT a medical doctor but these have been awesome for our family. Please check with your doctor before adding any supplements to your routine. This liquid probiotic is fabulous. Kate cannot swallow pills/capsules and Harry says most probiotics hurt his stomach. These drops are completely tasteless and do not upset anyone's stomach. They can also be used as a spray for your skin for acne. I love these probiotics and am so glad I found them. I think I will be posting a recipe I slightly adapted next and then continue the college series. Have a great day. College visits and tours are very important in this whole process. Your child needs to get a really good feel for the campus and the environment. We have done lots of local and long distance tours with our boys and more are planned for this year. In fact, in the next few weeks, Dave and Harry will be visiting Tulane and Loyola New Orleans. Harry visiting Loyola Marymount in Los Angelos last February (Presidents Weekend). Unless you are traveling and happen to be near a college of interest, I do not recommend touring a lot of schools before the beginning of junior year. This is strictly my opinion but I will tell you why I think that. Choosing a college is extremely overwhelming. It will likely be one of the biggest decisions your child has made thus far in life. I think that if we start the process too early, they get burned out and have a more difficult time figuring out what they really want. I also think that talking about and pushing "college stuff" too early leads to tension in the family. You want your kids to be excited to look at schools not get sick of it. Most kids completely change their "list" of schools in their head and if you start too early you waste some time, energy and money. Furthermore, most of the kids touring are juniors and seniors and it is intimidating and changes the "feel" of the tour if you are a freshmen or sophomore. And the feel is really how a lot of people remember the school. So, I think junior year is a good time to start visiting schools. Once your child has a list, start locally. College visits can be very expensive. When you factor in days off from school (our school only excuses 2 days for college visits) and work, plane tickets, accommodations, rental cars and meals, they add up. So, my advice is to get a few local visits under your belt first. We have done them in Texas, California, Virginia, Ohio, South Carolina and Louisiana. Dave and Harry are going to New Orleans this month and probably back to CA in the Spring after we know about admissions. Me and Will at Baylor 3 or 4 years ago (also Presidents weekend)! Furthermore, I advise you/your child to look up how important a "touch" is to the schools your child is applying to. A "touch" is any interaction your child has with the school. It can be an email, attendance at a local information session, meeting with the admissions rep when they visit your child's school or a campus tour. Some schools track "touches" and consider them in the application process. Some schools do not. The reason this is important is that most people cannot afford to visit every single school they are interested in (unless they are local or have a very small list). So, I suggest visiting the schools that count touches and/or the ones your child is most interested in first (before application decisions) and save a few visits for after they are admitted and have their financial package. Let me explain with an example. Will was applying to schools in Texas, Colorado, Virginia, South Carolina and Ohio. We simply could not fly all of those places in one year. In fall of Junior year, Dave and Will flew to Virginia to visit UVA and William and Mary. And then we drove and did lots of Texas visits Spring of Junior year. We waited to see where he got in and what kinds of scholarships he got before any more visits. Then when he had narrowed his choice down to three schools ((winter of senior year), he and Dave flew to visit Clemson and Miami of Ohio. They never even visited the Colorado schools (which worked out well because they were not in the final running). He got into all of his schools but by the time he was making his decision, the Colorado schools were not in his top three so we saved a lot by not visiting them. Tips for the actual visit. 1. Try to plan your visit when school is in session. I know this is hard to do sometimes but Presidents weekend and fall holidays are good times to visit. I highly suggest you book the tours well in advance if you go on a holiday weekend like Presidents Day as the tours fill up. We go Presidents weekend in junior year to scope out possible schools and in senior year to confirm schools that they have been admitted to. You want to see the campus in full swing. You want too see the student body and what it looks like on a typical day. I like Friday or Monday tours. 2. Plan to stay in the area for about 24 hours. The actual "tour" is one very small part of the visit. It lasts an hour or two. Your child cannot make such a big decision based on 1-2 hour tour. Roam the halls of the academic buildings. We have knocked on doors of business and geology professors and started up chats with them. Eat in the dining hall and at the local restaurants and people watch. See if you can get someone to take you through the residence halls (most tours do not do this for safety reasons). Go to the recreation center and strike up conversations with students to see what they like and don't like about the school. See if you can attend a concert or show or student activity. Read the campus paper. Visit the bookstore and the student activity center or office of Greek life. The goal is for your child to see if they can imagine themselves living there for 4 years. If your tour is on a Monday, go a day early and go to church. We have taken our boys to Mass at schools they are considering and I think it has been very helpful. I also suggest a visit to the campus ministry center, Catholic center or Hillel center or whatever your faith based center might be if that is important to your child. When traveling, Dave and the boys have also explored the local city life, hiked and driven around. It is important to get a feel for the whole area especially if it is far from home. 3. Look at the truly important factors. A tour guide and weather can make or break a tour BUT it shouldn't. I remember our tour at SMU the best. We had the most charismatic tour guide. He was funny and interesting. It was the most gorgeous day with blue skies and sunshine and perfect weather. Everything about the tour was perfect. I was ready to enroll myself. While it was the best tour, it was not the best school for Will. Similarly, if you get a boring tour guide or it is a miserable day, do not transfer those feelings to the school as a whole if possible. That is why I think it is really important to spend lots of time on and around campus outside of just the tour. 4. Stay near the front on the tour. The tour guide casually chats in between locations/stops on the tour and there are SO many useful nuggets of information you will miss if you/your child is in the back. This is super important. 5. See if you know a current student and arrange to meet up with them. This is not always possible but I have always asked my friends if they knew any current students at the schools we were about to visit. Honestly, someone almost always knows someone. My kids have often met with a current student for a quick coffee or chat or tour of the residence hall with a student we knew from home or a mutual friend. Anyone know anyone at Tulane or Loyola New Orleans? 6. Send a thank you email to the admissions person or liaison. I will be honest I am not sure my boys did this every time but I encouraged them to. I think it makes a nice statement and you never know what is going in that admission file. It could count as a "touch." This is the cathedral at University of San Diego. Harry and Dave attended Mass there on their visit last February. I have gotten several emails and direct messages from people telling me how much they appreciate these posts. And I have to tell you, that is why I am doing them. I am so glad they are helping many of you. I have one or two more in this series but I think I will post something fun and light (unrelated to the college process) next. Then, I will post the overall timeline and tips for applications and essays. I love your feedback so leave me some in the comments. This is likely the most unpleasant part of the process for many kids and families. For us, it was pretty easy with one son but the other one wanted NOTHING to do with the testing at all. So, what I write about today regarding testing is what worked for us and those around us. I will preface this by saying we were very fortunate and our situation is not typical. Our boys are extremely good test takers and they always have been so we had a good foundation. They ended up doing really well on the ACT and SAT and I think prep had a lot to do with it. However, I have advised clients with children who struggled with test taking and this approach also helped them tremendously. Fortunately, the boys' high school offers the PSAT freshmen, sophomore and junior year in October so they get plenty of practice taking it and we could see what their strengths and weaknesses were. Similarly, they offer the practice ACT. If your child's school does not offer these, you can find other places for them to take them. I highly recommend this for a few reasons. 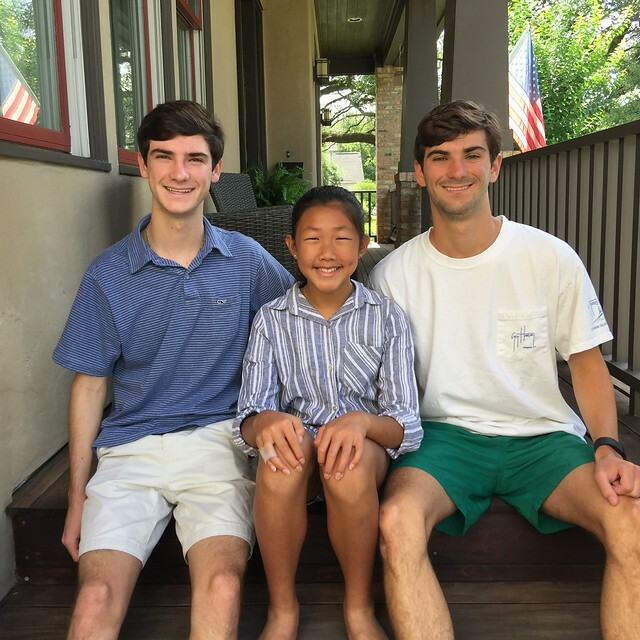 First, one of our sons did very well on the ACT but very average on the SAT. Once we knew that, he focused all of his attention and effort on preparing for the ACT. He never even took the SAT. The other son did well on both. So, he prepared for both (much to his dismay). Also, taking practice tests helps you identify areas that your child needs to work on and it can help you set realistic goals for both college admittance and scholarship money. I bought this book and this book for the boys and encouraged them to practice a bit the summer before junior year but I did not nag them. Then, in late summer/ fall of junior year, I enrolled one child in the SAT prep course. I timed it so that he would finish the course before the October PSAT junior year. That is the only test that could possibly qualify your child as a National Merit Scholar. If there is no chance your kids will qualify (which is most of us) then you don't need the prep before this one. It can wait a few months. But if your child scored very well on the practice tests, you might want consider the prep before the PSAT. We had a good idea by early Fall of junior year how the boys would do on the ACT and SAT. Harry took the SAT in November and December but his first score was the highest. That is the one he sent to all of his schools. 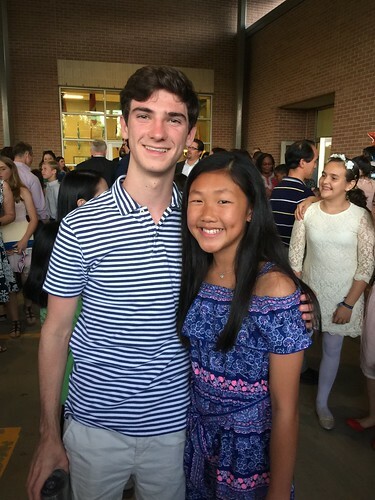 Will took the ACT 2 or 3 times Junior year and I think we sent 2 sets of scores to his colleges and they superscored (combined the highest of each subset). It was really nice to be done with testing by mid year Junior year. They both decided when they were happy with their scores and when to stop taking the test. Honestly, Harry only wanted to take the SAT once but I encouraged him to take it twice. Scores typically increase slightly. I think what helped the most with testing was the prep. We used Test Masters for both boys and both of their scores improved significantly. We will use them with Kate when the time comes too. They are reasonably priced, thorough and they get results. We made our boys enroll in the classroom option not the online prep. I think they learn better being there. It is an intense month when they take the prep course but it is only a month. Now, I am not saying they loved the prep classes (well--one boy was fine with them and one hated them) but we think it was well worth the time and money. We knew Will was taking the ACT in early February of junior year so he took the class for the month of January for maximum benefit. Harry took the ACT prep and test the same time of his junior year. He also took the SAT prep in September for the October PSAT and November SAT and did very well. Harry also worked with a math teacher at his school for one or two private lessons. Harry is really good at math and had a great score but there were a few mathematical concepts he had not learned yet in the beginning of junior year even though he was in AC math. It was easy for him to learn those concepts in an hour or two of private tutoring just before the SAT. We have several friends who hired private tutors for thousands of dollars and the kids' scores did not change at all or just slightly. Many people here use private tutors but I don't think that was the direction for us. I am sure there are great ones out there. I just did not hear much success locally. From my experience and what I hear from my friends, the prep courses do a great job if your kids do what they suggest and attend the classes. I do think that for most kids, some sort of test prep pays off. Most merit scholarships are given based on test scores and GPA. 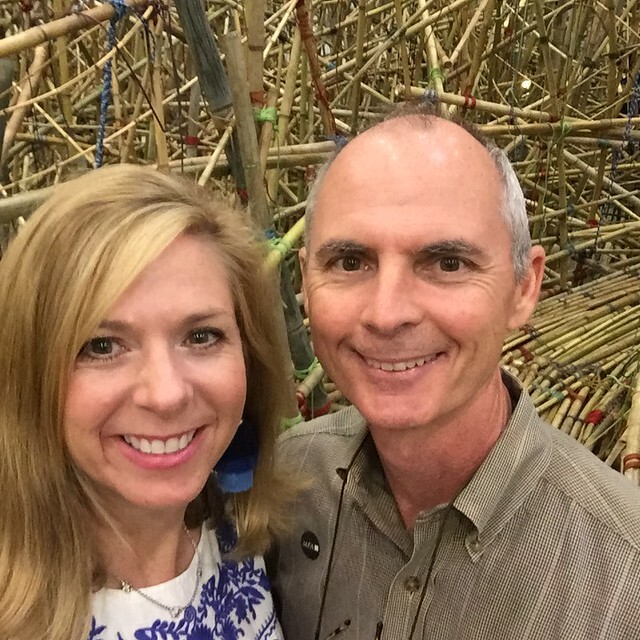 So, Dave and I figured it was worth a small investment in a prep course because it could end up increasing their scholarships by thousands of dollars each year (And it did!). There are lots of companies out there that do prep but I swear by Test Masters and I have no affiliation with them. We just saw amazing results. You should ask around in your area for test prep recommendations. Ask parents of kids a year or two older than yours. I would only pay for a prep course or tutor if you get personal recommendations for great results. 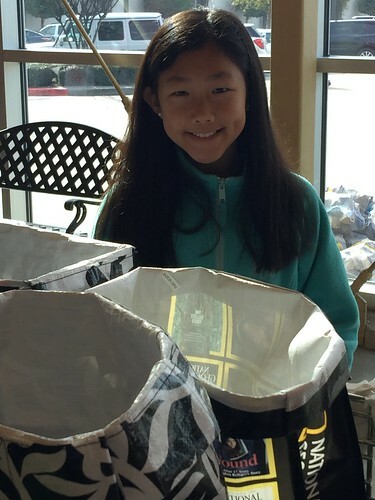 Perhaps in your area, private tutoring yields great results. Test Masters and other companies guarantee their course and if your scores don't improve, you can retake the course for free. Both of our kids had the improvements that they predicted. Also, I don't think you need to spend a fortune on test prep. I think our courses were under $500 (which is a lot) but they literally got our boys thousands of dollars by putting them in the highest merit scholarship brackets. Also, the boys were very motivated to do well. They both were applying to several private schools and out of state schools and they knew that academic scholarship money was important. If the cost of a tutor or a prep course is simply too much, at least purchase the prep books and have your child practice those. They really do help. Harry took one SAT subject test but it is not necessary unless your child is applying to highly competitive or Ivy League schools. In fact, my suggestion is to look at the schools your child plans to apply to and see what they want. All the schools we were looking at accepted either the ACT or SAT...except UVA (back then they wanted the SAT). And most do not require subject tests. They can help in extremely competitive programs, major and schools though. Our boys chose to send their best scores to the schools and did not send any scores right away. We waited and sent scores once they applied and picked which scores to send where. If your chid is in on level classes (not AP) especially for Math and Science, I would wait until the end of junior year or very early summer after junior year to take the SAT and ACT. That would be ideal timing. They can even take it again in September or October of senior year if warranted. Many of the concepts are taught in the Spring of junior year and they will likely do better if they wait. So in sum, if your child is in AP classes, start SAT and/or ACT prep early to mid junior year and try to complete all test taking in the junior year. Take each test 2 or 3 times. Many schools will super-score your results and often test scores increase. If your child is in on level classes, start prep in the winter to spring of junior year and take the tests as soon as possible toward or after the end of spring semester. That way all of the material should have been covered in classes. Subject tests are predominantly for kids applying to Ivy league or extremely competitive programs and only in the areas you are very knowledgeable in. They are quite difficult. One last note, if your child simply is not a good test taker, do not despair. Many college do holistic reviews and testing is just one component. I have also read about more and more schools not requiring testing at all. It is only one aspect of an applicant. Yes, it is still important but I think it is becoming less important. Let me know your thoughts/questions in the comments. I am enjoying blogging again but I only want to do it if people are reading and enjoying it too. Next up: How to get the most out of a college visit. When I asked readers for topic suggestions, several people asked me to share how we handle the college search. I know this will not be of interest to some readers but since we are in the midst of this process with Harry, I thought it would be a great time to write about it as it is very fresh in my mind. This will be a series of posts because it is a long process. Also, I am not a college consultant. I am a Mom who has gone through it twice. With my counseling background, I have considered applying for a job as a college counselor because I love this process but I am certainly not a expert. I am simply sharing how we have done it and what has worked for our family. There is more than one way to approach the college search. Let me start by saying I do not think that the four year college experience is for everyone. I used to think it was for most kids but I have seen so many kids suffer and drop out and experience extreme anxiety and depression being far from home and trying to make college work. As a parent, I think being open minded and really listening to your child is very important. We want our kids to be happy and independent and there are many routes to that place. I think community college is a wise start for many people. It is economical and for some kids the whole moving to college thing is overwhelming. There is A LOT of drug and alcohol use at college (more than I ever imagined) and for some kids who struggle with those issues or don't want to be around that, community college is an excellent starting place too. Also, many kids have no idea what they want to study when they are 18. My boys have/had so many AP credits that they kind of had to pick a major very quickly. That was very intimidating for Will and he shifted his major around a few times within science (biology, geology and environmental earth science). Starting at a community college buys you some time to explore majors and save money while doing so. So, my suggestion is not to rule it out immediately. I also think other options like a gap year, the military, culinary school, heating and air conditioning and plumbing certifications are great options for kids these days. I know that is not the mindset a lot of parents have but honestly, I want my kids to be able to make a living and love their life and work. I am not going to be a snob about how they do that as long as they are fulfilled. One kid we know is studying to repair airplanes instead of going to college and he will earn more more than most people (six figures) doing what he loves. I think that is awesome! So, here is how we start. We try NOT to talk about college much at all freshmen year. It is a stressful year simply adjusting to high school. The high school our boys went to is a very rigorous college prep school. It is challenging. All the kids are talking about Stanford freshmen year and comparing PSAT scores and they are stressed enough. So, we just let them get used to high school and do not talk about college this year. They do take a PSAT in October but that is about it for our mentions of college and college prep. Starting sophomore year, I attend the college fair at their high school with our kids just to get some names and places on their radar. We walk around, grab brochures and talk to the reps but it is very low key. There are so many incredible schools out there and most kids have not heard of lots of them. This is great opportunity to get the information while they are not stressed about it. Similarly, if we are traveling and we are around a college, we might take a peek but it is pretty casual. They also take another PSAT in October of this year and a practice ACT at their high school. Junior year is when we kick things up in our house. As a parent, I have two goals for junior year with our kids. One is to have regular discussions about what they are looking for in a college and the other is to get the testing process going and hopefully completed. My next post will be all about the SAT and ACT but know that we do all of that prep and testing junior year. So, starting in the fall of junior year we have regular meetings with our child. They are typically on Sunday afternoons because that is a time when we are home and relaxed (but definitely not every week). We start by brain storming some things they might want to study and career options. You have to let your child be the one coming up with the ideas. So many parents tell their kids what to major in and that typically ends badly. I used to be a college professor and I had so many kids I advised that were doing poorly and hated their major. When I asked them why they were an accounting major, they said "My Dad told me to major in it so I'll always have a job." I get the reasoning (from Dad) but these kids were miserable. I cannot imagine my kids doing a job they hate for the rest of their lives. I see enough adults in my practice with that problem. In these meetings, we listen to what our kids think they are interested in and we give feedback about strengths we see in them and how that could relate to a major or a career. We have also set up lunches and conversations with adults we know in these various fields so they can ask questions and learn more. Honestly, our kids didn't always like this but I think looking back they appreciated it. We were introducing them to networking which is crucial. We really see this time as one of exploring possibilities. Once they identify possible areas of study, we move onto the next phase. Before I get to the next phase, Dave and I have homework as well in this process While our kids are thinking about a handful of possible areas of study, we examine our finances. We have saved/invested to send 3 kids to college but some colleges are $22,000 and some are $75,000 a year. Dave and I look at the college fund and come up with a range we are comfortable paying. We let our child know that they are welcome to apply to schools that are much more expensive but they have to find scholarships to make it affordable for our family. And you'd be surprised to learn that many of the private schools or out of state schools offer enough scholarships to make them competitive with in-state tuition if your child has good test scores and an above average GPA. 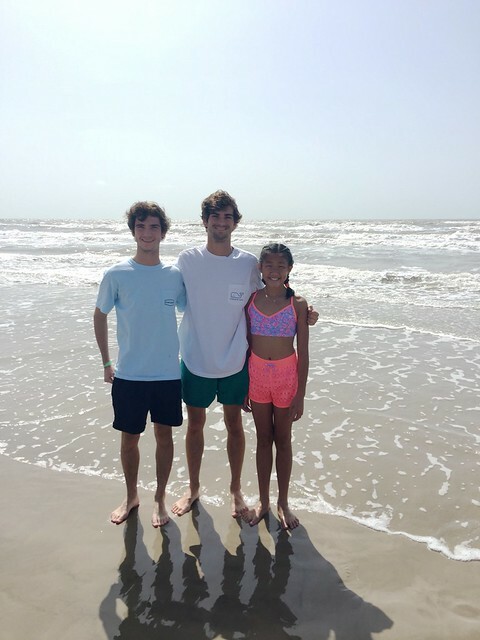 Will has so many scholarships that his out of state school is less than both his high school tuition was and in-state university options. My suggestion is to visit the school websites and look for merit based aid and typically you can see what your child would be eligible for based on their current GPA and test scores. Not every school gives that information but many do. I think it is really important to be honest and clear about the budgetary part of this with your child. This is one reason our kids did not apply to any Ivy league schools, they do not give academic scholarships and they cost more than we were willing to pay. We do not qualify for financial aid. We'd like our kids to graduate debt free and remain that way ourselves. This is an excellent time to teach your child about fiscal responsibility. Our next phase is having the child identify factors they seek in a college. I want them to pick a university based on the attributes rather than the name. I want them to pick a place they will feel safe and comfortable and thrive. We have them consider things like, do they want to be in a city or small town or in between? Do they want to stay close or go far away? Do they want a small school, medium or large? Will they have good research opportunities or internships nearby? Do they want a religious affiliation? Do they want Greek life? Is it in our budget (or will it be with merit scholarships)? Are they interested in a study abroad program? Do they want a "football" school (lots of kids want this college football game/tailgating experience but some kids don't care.)? Is there a region of the country they prefer? Are they a competitive applicant given their GPA and test scores? Will claimed he would only apply to southern schools. Ha! He picked a northern school. Harry only applied only to schools in warm climates even though there are tons of top business schools up North. He loathes the cold and knew he did not want months of gray winters. They may not have all the answers to these questions but it is good to get them thinking about it. Finally, we have them generate a list of about 10-12 schools that offer the areas of study they are interested in and includes the factors they deem important. The way they generate that list is up to them. We have tons of books to reference, they use their school Naviance program and the internet. I think Harry googled the best entrepreneur programs. From that search, Babson and the University of Houston are both in the top five. He ruled out Babson mostly because Boston=cold weather and University of Houston is too local. One compromise school was Baylor. It is ranked very highly for the entrepreneur program but he prefers to be in a city. So he is visiting and applying and might end up there. They weigh each factor carefully against the others. We have told our boys it is about finding a fit. There is not one "perfect school." You look for a handful that have a lot of the things you want. The reason we have them generate a list of 10-12 schools is that ideally we want them to choose about 5-6 schools to apply to that we can afford, that they will likely get accepted to and that they will be happy to attended. They research and consider the 10-12 and narrow it down later in the application stage. In the end, Will applied to 8 or 9 schools and was accepted at all of them with academic scholarships. Harry has applied to 8 schools so far and we think he is done. This is definitely more that I think is necessary but several schools waived the application fees so they applied to some that were "maybes." My boys did not always love the meetings and the "homework" we gave them to research areas of study and colleges. They rolled their eyes and complained sometimes. But often another parent or teacher would remind them how lucky they were that we were guiding them. 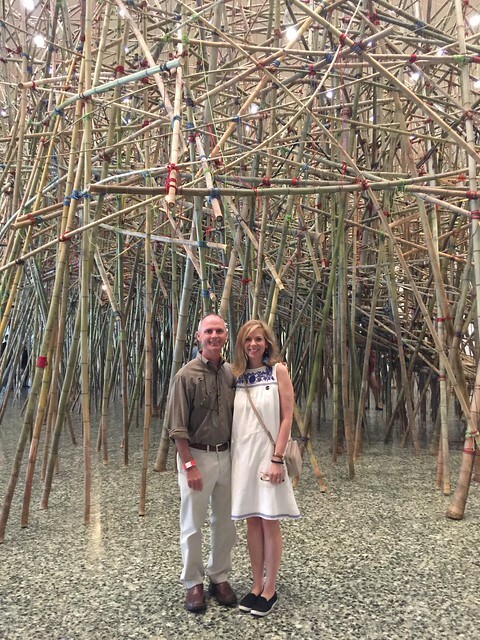 Both of their guidance counselors were amazed at how ahead of the process and well prepared they were. The ultimate choice is up to the child where to go but we felt like we needed to help guide them to figure out the best options. And honestly I enjoy helping them with this. Let me know in the comments if you have any questions so far. I really value your comments and feedback. Next up--how we handled the ACT and the SAT. Then, I will post about getting the most of the college tours. And finally I will post the actual application phase, essays and a timeline. When I asked people what they'd like to see me blog about fashion and parenting were the top two requests by an overwhelming margin. 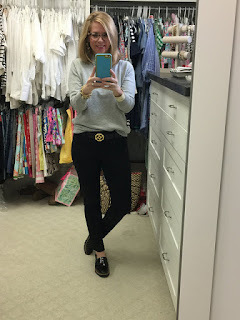 I was kind of surprised at the fashion response but am happy to do some posts on things I like. I have 3 posts planned this week on fashion and the college application process so check back. This week we should see the beginnings of cooler fall weather here in Houston (finally!) so I thought I'd start with some things I like for Fall. This summer, I spent some time decluttering (as I do a lot) and I worked on my shoes. I realized that while trends come and go, I tend to stick with a few classics each season. I know booties have been all the rage the last few years but they just are not for me. I am petite and I don't think they're flattering on me even thought they look great on others. But also, I don't think they jibe with the rest of my wardrobe so that is a trend I am skipping. I feel like if you build a wardrobe of quality classic pieces, you can add in a few trends you like here and there. There are things I have had in my closet for over 20 years that I still love and still wear. During my declutter, I realized that I wear a ton of loafers, pointy toe flats and ballet flats in the fall. I also like boots, just not booties. When I did my closet clean out, I had a few pairs of loafers that were in bad shape so I knew I needed to replace a few this year. I tend to wear cream, tan and black ones constantly. So here are a few favorites I found and love. I wear a lot of cream and winter white and I fell in love with the shoes immediately. I love this brand. They make beautiful classic shoes that are comfortable and chic. This one is currently on sale for half of what they typically run. I would say they run true to size and do not require breaking in. I love that the soles have a protective lining because it is rainy and humid here and I always get my leather soles lined so that I don't slip. This saves me that expense and time. 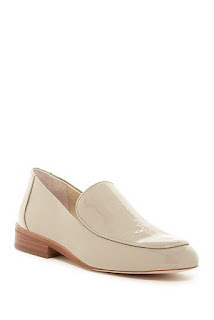 This shoe is a similar loafer that comes in black, mink (which is the one I have and goes with everything!) and deep wine/brown color. I like the metal bit detail. 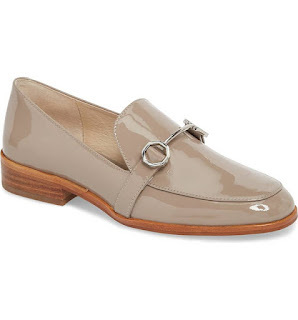 It reminds me of the Gucci loafer but at 1/10th of the price and honestly I think these are better quality after trying on both brands. I love this shoe in the Mink patent so much! 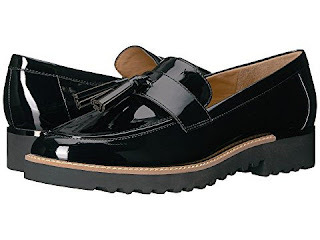 I bought these black patent loafers (mine do not have the tassel though) at Marshall's about 2 weeks ago and I LOVE them. So check your local TJ Maxx and Marshall's but if you cannot find them there, you can order them here with the tassel. 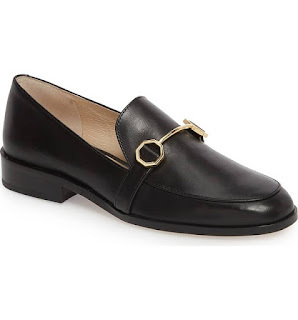 If you prefer a penny loafer instead of the tassel (like mine) you can find them here too for under $40! That's what I paid. They are so comfortable and they are classic but a little edgy because of the sole. I have worn them about 5/6 times in the last 2 weeks. I think I will wear these a lot and they will last a long time because of the sole. Here is a picutre of me in mine. When doing my decluttering I also realized that I really needed a navy flat. I wear navy a lot and have a navy skirt that I rarely wear because I didn't have the right shoe. 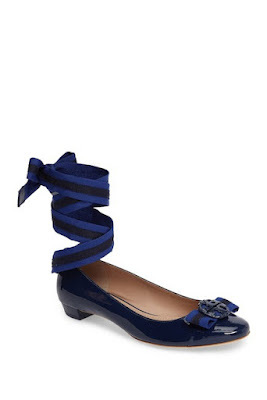 I have honestly looked for a versatile cute navy flat for a long time and I recently found this one on major sale and ordered it. It has not arrived yet but I know my size and comfort with Tory Burch so I think it will be great. The best part is it was 60% off. I do not think I will wear the detachable ribbon much. But it makes a pretty option with a skirt. 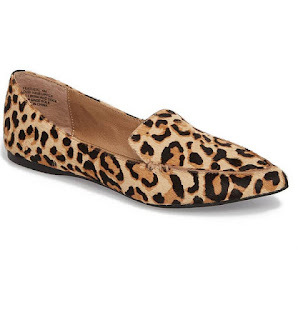 Finally, I love a calf hair or leopard shoe. I have a few pair from past years so I did not need a new one but these are really cute and versatile and gets excellent reviews. Mine are all a few years old but I wear them a lot all fall and winter. I love really well made, classic shoes and I do love a bargain. All of these are well under $100 except the navy which are just at $100 (regularly $250). I hope you enjoyed seeing these options. My next post is the first of a 3 part series on the college application process. I think the series has lots of useful tips and a good timeline too. I will post other things in between though because I know not everyone is interested in the college application series. But if you have any children in high school or even 8th grade, it should be a good read. Tell your friends who have high school kids too! First a giant THANK YOU! I simply cannot believe the number of encouraging and supportive messages I got yesterday (mostly through IG direct messages). You guys know how to make a person feel good. I truly had no idea that many of you really missed our blog. I thought I'd give a family update here since many of you said you really miss that. It's long. Dave doesn't have social media so I try to keep his profile low but he doing well. He is golfing a bit, fishing and working. He travels to Spain and France and Israel for work sometimes. 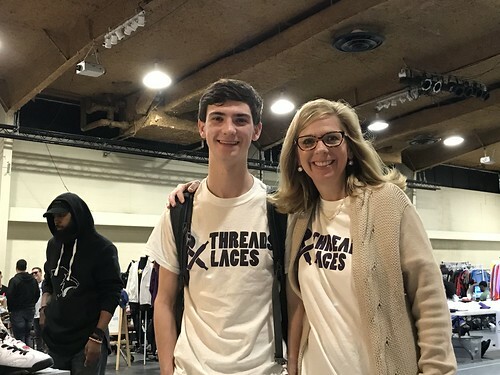 Will is in his 3rd year of college and doing really well. He turned 21 this summer and we celebrated in PA (post to come). He is in a fraternity which I have mixed feelings about but I think he has found a really healthy balance of activities in college. He is majoring in Environmental Earth Science and Sustainability. He also has a focus (maybe a minor) in Geology and is usually on the Dean's list. He works in a biology lab doing limnology research. I don't know exactly what he does but it involves plankton and larvae and water:) He is involved in some Christian groups on campus and is a Scholar Leader this year. This January he will be doing a J-term study abroad in Italy. As a science major, he could not really do a semester abroad because they do not offer the courses/labs he needs but this should be a fun experience for him. He will be in Rome with a short trip to Florence. He is looking for a summer internship for 2019 in Environmental Science or Sustainability and is willing to go anywhere for the opportunity. So, let me know if you know of any! It is hard to find internships in that field. I am so incredibly proud of the man he has become. Harry is doing great. 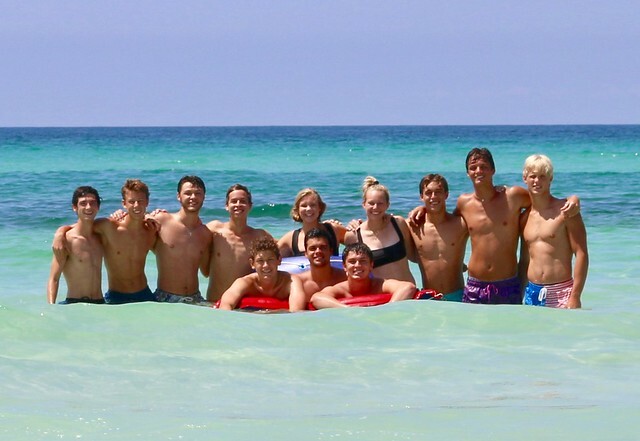 He finished his 10th and final year at Camp Ozark this summer and had a blast. That place is etched deep in his heart. 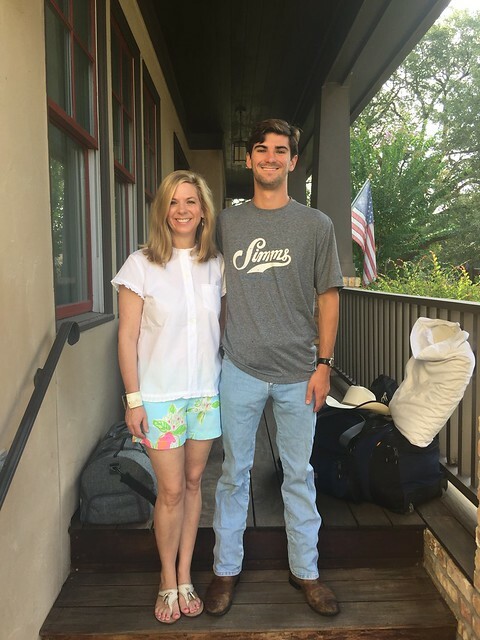 He is a senior at an all boy college prep school and ready to get on to his next adventure. Lots of you asked about his migraines. They are pretty much gone. He will get one occasionally but overall they are rare. He has become an incredible photographer and focuses mostly on music/concert photography. He is also still an entrepreneur and has so many fabulous business ideas going. Harry is my kid who really did not like reading but once he found books on building businesses and marketing etc, he has his nose in a book a lot. 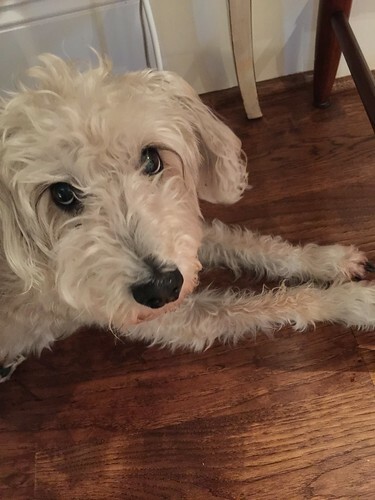 He has applied to 8 colleges (UT, Baylor, Loyola New Orleans, Tulane, Loyola Marymount, University of San Diego, USC and University of Santa Clara). He is super smart and I think he will have some great choices. He refused to apply to any of the excellent business schools up north because he hates the cold! I truly cannot believe he will be gone in 10 months but he never really loved high school and is wise beyond his years. College will be so good for him. Kate is in middle school and very busy. As many of you know she quit competitive gymnastics and it turned out to be a great decision (going to write a post on this soon). She ended up going back to dance and has just flourished. Last Spring, she was invited to participate in a photography class through Rice University and loved it. She is doing magnet dance, art and gymnastics at her school and she wants to join everything! She dances at our local studio and auditioned for the company this year and made it. She is in 4 company dances this year so she is at the studio 6 days a week. I was very hesitant for her to dance so much but it is about 11 hours a week which is HALF the time she was in the gym. She manages it well with homework and has all A's. She really loves dance and there is none of the pressure that stressed her out in gymnastics. She has a fabulous group of girls she dances with and they are all friends. She is so happy. She still loves to bake but I don't love all that sugar in our house so we have cut down on that a little bit. She bakes for friends and has a few "customers" who pay her for cookies etc. She loves to read and is just a happy 12 year old. I am pretty good. I actually had a very rough year. I won't go into specifics but I got very very sick after Hurricane Harvey. I lost weight, couldn't eat and had some serious infections. I have worked really hard to get myself healthy again. I had some relapses and setbacks but I am doing well. I work part time in my office a few blocks from home seeing clients for marriage, relationship, parenting and life coaching/counseling. I also speak about once a month at schools, churches and other organizations on Parenting and Family and Marriage. My most popular talks this year are on Technology and Kids and Boundaries in families. I love my job. There is no better feeling than knowing you are helping someone make their family or marriage stronger. And I have the best clients. I am also in a few book clubs that I really enjoy, a fabulous women's prayer group that meets once a week and I still go to Bar Method for exercise. I try to go about 3-4 days a week but with my health issues it has been sporadic this year. So that is where we all are today. As I proofread, I realized that it sounds like a lot of bragging about my kids. Let me add...we have our fair share of talking back and anxiety and mood swings and other problems in our house. We do. I definitely am sharing the ups here. And for the most part, these kids are pretty easy and I am super proud of them in their own unique ways. So far people have said they want to see recipes, fashion, family updates and parenting topics. Let me know in the comments if you have other suggestions for blogging topics. Welcome to Our Little Ladybugs! Just a photo from a while back. This is a place where I journal about our life as a happy family of five.